Box Dimensions (LxWxH) 11.5 x 5.0 x 2.0"
3-Pin XLR Male to XLR Female Microphone Cable (3-Pack) - 18' is rated 4.0 out of 5 by 8. Rated 1 out of 5 by Andrey R from Worst quality ever All 3 cables in the pack broke within a year (first one within 2 months!). Yeah they are cheap but these savings are not worth the stress of a cable going dead in the middle of your gig. Buy Audio-Technica or Hosa instead - I've had much better experience with those brands. 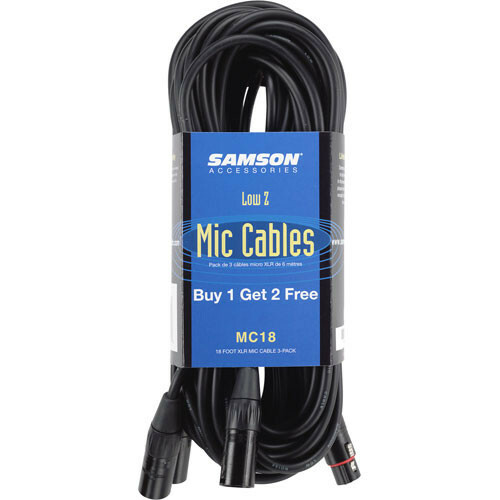 Rated 5 out of 5 by Solarhutt from # Pack Samson Quality of cable appears good. For the price I can't see how you could go wrong. I'd highly recommend for either everyday use or as spares to prevent that dreaded day of a cord failure moments before a performance. Rated 5 out of 5 by Anschuetz from Good value Had to pick up a few dozen of these for a gig and all worked flawlessly. None failed despite moderate handling and being used at an outside performance. I'll be buying more. Rated 5 out of 5 by Levi Bravo from PERFECT FOR ME Using in video production for filming live plays it is perfect for the job. Rated 1 out of 5 by Scot E Boom from Garbage All broke in 2 months in home studio via band practice.